T. M. Lurhmann is a psychological anthropologist, one who studies the interaction of culture and mental processes. In keeping with the best practices of her discipline, when she chose to study how God becomes real to people in today’s society, she immersed herself in the culture that she was exploring. The group she selected was the Vineyard Fellowship, a fairly small denomination within the broader charismatic stream of theology (about 550 congregations in the U.S. and over 1,500 worldwide). The Vineyard movement was started by Kenn Gulliksen in 1975, but did not really begin to take shape until John Wimber assumed leadership in the 1980s. Wimber was associated for a time with Fuller Theological Seminary, where he came in contact with Donald McGavaran (a well-known scholar of missions) and Peter Wagner (whose Fuller course “MC 510—Signs, Wonders, and Church Growth” was extremely popular but also very controversial). Wimber became convinced that the gifts of the Holy Spirit mentioned in the book of Acts and other New Testament writings were operative today. His influence and teaching has strongly shaped current Vineyard theology. When Dr. Lurhmann began her study, she did what any good anthropologist does: She became a part of the culture she was exploring. For two years she attended a Vineyard congregation in Chicago. When she later moved to California, she spent another two years in a Vineyard fellowship in the area where she lived. “Immersed” is not too strong a word for her approach. She attended Sunday church services regularly, joined a weekly house group (a small group of members who meet in a home for Bible study, prayer, and fellowship), and attended local conferences, retreats, and special worship times. Dr. Lurhmann was very open about her project and was pleasantly surprised to see how many of the church members were willing to share their thoughts and experiences with her. She had in-depth interviews with well over 30 members of the church and developed close personal relationships with many of them. The basic theme of the book is that one comes to know God in a learning process. The initial belief may be quick or slow, but once belief is established, the real work then begins. In her conversations with church members, Dr. Lurhmann came to the conclusion that truly learning to hear God is a slow, continuous process with a number of bumps along the road. There is an important element of discernment—being able to recognize God’s voice in the middle of the noise and turmoil of everyday life. This ability requires practice and generally is not successful if tried alone. The supportive community is essential, both for encouragement and for correction when someone goes off on a wild tangent. When God Talks Back: Understanding the American Evangelical Relationship with God is not without its shortcomings. The Vineyard churches (and other Pentecostal/charismatic fellowships) are not truly representative of “main-stream” evangelical churches, so the title is a little misleading. Many evangelical Christians reject the idea that the gifts of the Holy Spirit described in the New Testament are operative today. The other issue with the book may be methodological. The author was looking for a process or technique. While Dr. Lurhmann does an exemplary job of exploring this aspect of the issue, she has not yet made contact with a basic tenet of Pentecostal/charismatic theology: the involvement of the holy spirit in the process. This is undoubtedly the most difficult aspect of the whole investigation for an outsider to grasp. The book is extremely well documented. Anyone wishing to explore the subject in more depth will find a wealth of references listed. 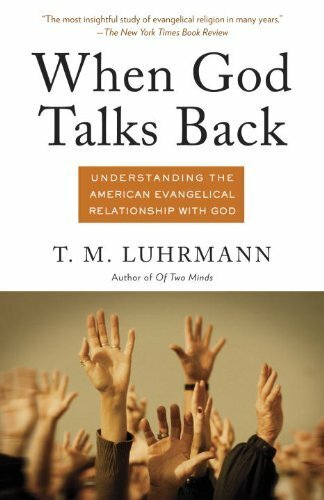 When God Talks Back is not a “scholarly” tome in the traditional academic sense; it flows too easily and is too readable. This book can well serve as a solid foundation to further exploration of the topic. When God Talks Back is an insightful, sensitive, and compassionate study that goes to the heart of many issues of prayer and the awareness of God in our midst. Dr. Lurhmann is to be commended for both her in-depth study of the topic and her caring spirit as she became involved in the communities of faith that she visited.